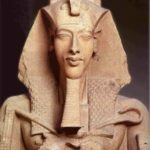 Akhenaten known before the fifth year of his reign as Amenhotep IV (sometimes given its Greek form, Amenophis IV, and meaning “Amun Is Satisfied”), was an ancient Egyptian pharaoh of the 18th Dynasty who ruled for 17 years and died perhaps in 1336 BC or 1334 BC. He is noted for abandoning traditional Egyptian polytheism and introducing worship centered on the Aten, which is sometimes described as monolatristic, henotheistic, or even quasi-monotheistic. An early inscription likens the Aten to the sun as compared to stars, and later official language avoids calling the Aten a god,giving the solar deity a status above mere gods. "To be satisfied with a little, is the greatest wisdom; and he that increaseth his riches, increaseth his cares; but a contented mind is a hidden treasure, and trouble findeth it not." "Those who gave thee a body, furnished it with weakness; but He who gave thee Soul, armed thee with resolution. Employ it, and thou art wise; be wise and thou art happy." "Indulge not thyself in the passion of anger; it is whetting a sword to wound thine own breast, or murder thy friend."